In likeness to wrist watches, pocket watches are also popular at our silver and jewellery auctions, particularly amongst collectors. Hunt and Roskell. 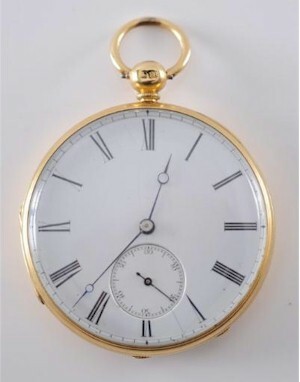 A Gentleman's 18ct Gold Hunting Cased Repeater Pocket Watch (FS18/159), which realised £1,950 at auction. There are three main pocket watch designs and styles: the open face, full hunter and half hunter. Each have their own uses and purposes. 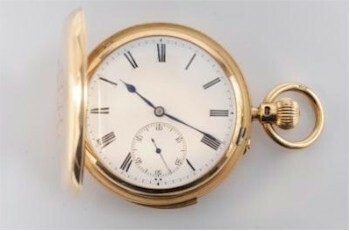 Gold pocket watches, depending on their gold content, can reach a high value based solely on their weight in gold, with the added value being that of a particular make and model. Silver, gilt metal and chrome watches are also available at auction but at a lower value. Barwise. An 18ct Gold Cased, Key Wound Duplex Openface Pocket Watch (FS17/262) achieved a hammer price of £720. Although pocket watches are a watch design on their own, there are various different styles and designs that set them apart from each other, much in the same way as you have different style wrist watches. Pocket watches are very collectable, depending on their movement, make, model and design. Patek Philippe, Rolex and Railroader's Watch are all desired companies for watch collectors. All of these watches are likely to include a serial number, which is unique to each individual watch and can help determine their release, date and origin. High prices can be achieved for these watches at our auctions.